Working with a highly qualified full-service asphalt paving company with top-of-the-line equipment and years of experience is the best way to handle any of the commercial paving projects you have in mind. Whether you need just one type of service or you have many diverse projects in the queue, it is likely an asphalt paving company can handle them all. Here are the most common commercial paving projects that you might need. Road Resurfacing – Whether you are in charge of roads for your municipality, gated community, apartment complex, shopping center, or something else that has thoroughfares or roads, road resurfacing will be needed from time to time to ensure smooth traffic flow and safety. Concrete Curbing & Flatwork – Whether you need curbing for around a parking lot, adjacent to roads, or another use, or flatwork such as sidewalks, parking lots, dumpster pads or concrete islands, your commercial paving company can handle anything from excavating the soil and preparing the base to pouring the concrete. Demolition & Excavation – Many commercial paving projects need to begin with demolition and excavation, whether that is to clear a field before putting in a parking lot or removing old pavement to start fresh on a new project. 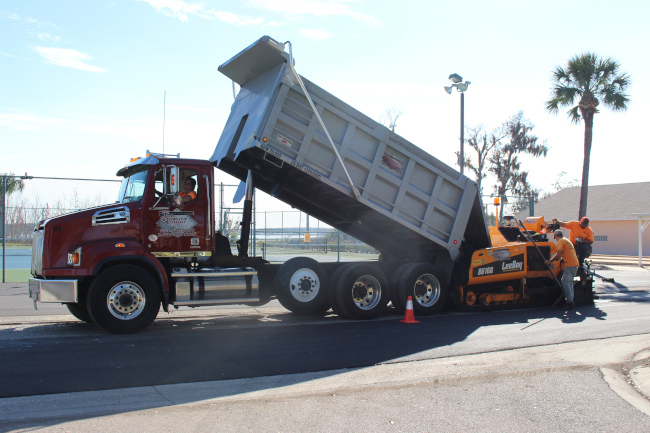 HOA & Condominium Asphalt Paving – If you are in charge of managing a community, you will regularly need asphalt paving services to keep roads and driveways in top condition. Pavement Markings – The finishing task for any road or parking lot is pavement markings to assure proper and safe traffic flow and parking, as well as meet code regulations for handicap parking, number of parking spaces, and so forth. Here at AAA Top Quality Asphalt, we are equipped to handle all these commercial paving projects and more in the Lakeland, Florida area. We have more than 40 years of combined experience in the asphalt industry, so you can be confident of a job well done. Contact us today to learn more, get answers to any questions, or schedule a consultation to discuss your upcoming projects.